I enjoy California's central Sierras, camping every month with a goal to match my age in nights out each year. For comfort I lug tent, mattress, chair and such. Typical summer trips run 5-8 days; 40 lb (18 kg), about half food and water related; about 5 miles (8 km) per hiking day in the bright and sunny granite in and around Yosemite. I winter base camp most often at 6,000 to 7,000 ft (1,800 to 2,000 m); 2 to 3 nights; 50 lb (23 kg); a mile or so (1.6 km) on snowshoes. 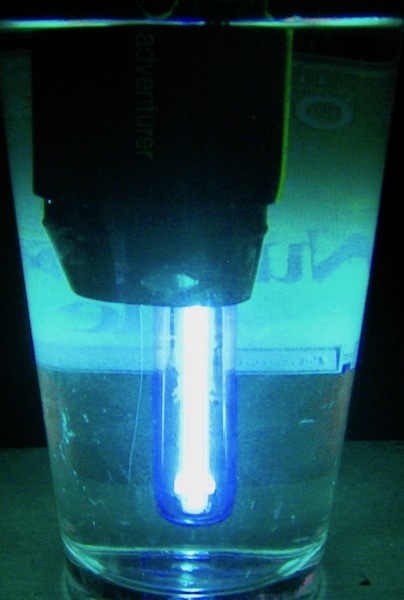 This unit develops ultra-violet light to treat water. As I understand it, UV light strips the reproductive DNA from organisms in the water; while the company blog says the unit "destroys" them. The lamp itself looks like a clear filament inside a clear cover. The lamp is protected by a cover when not in use, held in place by 'snapping' on. The unit has a sealed on-button with a tiny adjacent LED window. The window flashes red if the lamp has not been activated or has failed to work, such as having inadequate battery power or premature withdrawal. On initially pushing the on-button, once for 1 L (1 qt) or twice for 0.5 L (pint) the window flashes a green light. The unit requires immersion to the sensors for the window light to go out and the lamp to come on; and must remain so for the treatment cycle or the lamp will go out and the window light will flash red. When the treatment is complete the lamp will go out and the window light will flash green. If the treatment cycle does not complete, the window light will flash red. There is no off-button; the window light will go out after about 10 seconds. The sensors look like little oblong, inset chrome buttons about 1/4 in (6 mm) from the base of the lamp, one on each side. The lamp will not activate unless the sensors think they are in water. I've never timed a treatment cycle. It is tedious for me to sit there stirring the device in the water (as recommended); my partner cannot tolerate the torture. UV light treatment does not remove or add anything. It has no affect on chemicals. It does not change the taste, odor or appearance of water. It does not suffer damage from freezing. There is nothing to clog. Any cleaning is simply wiping the unit dry on my shirt. There is no maintenance other than battery replacement--two CR123 batteries inserted in the back end of the unit by removing the end cap, held in place by a screw. I've used the unit on 39 nights of backpacking in the Sierras in temps ranging from 25-85 F (-4 to 30 C), from 7,000-10,000 ft (2,000-3,100 m). I've only used it in clear water. I have to love this product for how light and small it is. In that regard it is perfect, especially for longer trips where I'm most sensitive to weight and bulk. I don't know how much water my unit has treated. I typically burn through a gallon a day on my own (probably 2/3 of the time), with half from boiling. I'm thinking it's fair to estimate treating perhaps 20 gal, or 80 L. This would be 160 1/2 L treatments. As I've disposed of the third set of lithium batteries, it would seem I'm not getting the 300 treatments suggested by the manufacturer for three sets of batteries. In fact, I was so disappointed with battery life after the second set that I sent it to SteriPen for service. They were extremely pleasant, giving me no hassle whatsoever regarding when/where did I buy it and/or how much have I used it; and returned the unit promptly with a note that it checked out perfectly. That was bad news to me as I'm evidently not happy with the unit's power consumption. I'm not partial to carrying spare batteries. My battery tester shows no difference between the last set of batteries that won't power the unit and a fresh set (from the same package of lithium disposables) that will. Thus, I don't have any way of knowing how much treatment potential remains in batteries and it is not my nature to put in new batteries every trip. I don't have any other device that runs on CR123s so I don't have a way to use up batteries that will no longer power the unit. The unit does not give any advance notice (that I'm aware of) that batteries are about to require replacement. They work until they don't, at which time depressing the on-button results only in a red window light. This leaves me to decide if I should use the unit only on short trips where I won't be in trouble for as long; but saving weight and bulk on extended trips are what make the unit most attractive. Evidently the lamp requires some horsepower as I've had many occasions where it would not work until I warmed the batteries, which can take a while. I've been with other folks who experienced the same issue with the same model. In Sequoia National Park (California) on a Fall trip at 11,000-12,000 ft (3,300-3,700 m) I was with 2 other guys who each had this unit (I didn't have mine) and I don't recall a circumstance where they were able to get both working at the same time. SteriPen's blog addresses this issue, suggesting the most likely culprit is that high-mountain water (snow melt) has too few minerals for older (pre-2009) to detect, and the mineral sensor must detect minerals before the lamp will come on (as a means of preventing non-immersion activation). As I don't carry a typical 1 L water bottle and my aluminum coffee pot is not lined (blog says stainless steel and aluminum are no issue as long as epoxy-lined), I've been toting a soda bottle with the top cut off in order to be able to achieve immersion. Then I pour from that vessel into my 1 or 2 L soda bottles. It's a step I don't like, and does add some bulk I could do without. Stowing the unit inside the treatment vessel does make me feel it is safer, even though I think the cap does a great job of protecting the lamp. SteriPen has replied to my specific query regarding the use of a metal coffee pot, replying that such use would be fine. On one occasion of a trip with my partner we came to a waterhole surrounded by a troop of youngsters. I didn't see them do anything as they were departing as we came into view, but my partner and I looked at each other knowing what boys that age are prone to do. (I was one; she raised several.) I affirmed that the unit does not actually remove anything, but only deactivates the reproductive capacity of live organisms. She was not of a mind to feel such treatment satisfactory. At other times with my partner I've found it somewhat clumsy to get ahead of water needs. The unit's fine on the trail as long as it will work on demand. It seems not so efficient in the grip of many other camp chores to get a gallon stored up for the two of us. On the operational front, I find the light output at the window a little hard to see with the treatment vessel sitting on the ground. Sometimes in bright sun I can't tell whether the lamp is on or off. I can't seem to break my instinct to lift the unit to look at the window, and that of course kills the treatment cycle if it is still in process. The moment the sensors come out of water, the cycle stops and the window light turns on red. This is a petty user error residing in the knothead category, though if the LED window were located on the battery cap it would be much easier to see. I'm not aware of any water treatment protocol curing all possible deficiencies. I like that this one is not ruined if it freezes, though in practice I have a great deal of difficulty making it work in the cold. It deactivates all living organisms including viruses, but leaves all creatures in the water, alive. It will never clog, but can be defeated by cloudy water. The treatment adds no chemicals to the water, but neither does it remove any. It's tiny and light, but requires a vessel I don't want to carry. If I can force myself out of old habits and stop whining, this unit should be a terrific choice, especially for long trips: Carry a spare set of batteries--still lighter and smaller by far than any filter I have; and find a skinny bottle with a fat mouth that will work as both trail and treatment bottle.